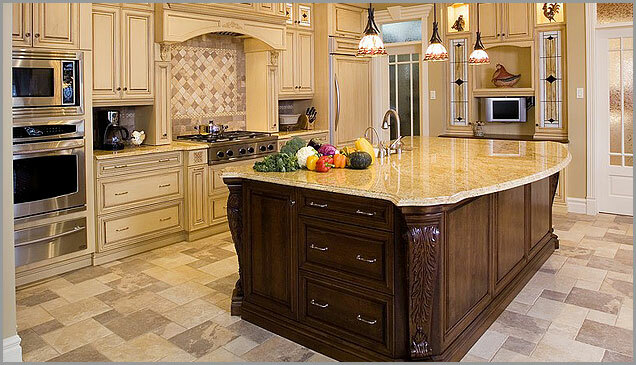 Photo Details: The beautiful kitchen is the perfect setting for Kashmir gold granite. The highlight of this kitchen is the large gold slab atop the center island, resting in the dark, ornately decorative wood. A stainless steel sink is set into the island, providing ample workspace in this spacious kitchen. The yellow color of the cabinetry is highlighted by the muted brown, yellow and gold tiles that grace the floor. An ornate backsplash is a central focus of the kitchen over the range with different shades of gold, yellow and brown carrying the colors of the gorgeous and exotic Kashmir gold granite.